If you’ve got a large yard or one where there’s a lot of hard-to-reach places, you may find that your mower can’t cover it all. Using the best electric string trimmer will enable you to reach awkward spots, trim edges, and ensure your lawn is kept well groomed. Electric string trimmers are relatively straightforward machines in the sense that you connect them to a power source, press a button, and they start. You then point them where you want to trim, and they get on with it. Nevertheless, even with such a seemingly simple device, there are going to be several differences between each brand, and each product. Our buyer’s guide will take you through some of the most significant, to help you better understand what to look for, when buying an electric string trimmer/weed eater. Unlike a mower which uses blades, when you are cutting grass, weed and thick brush with a trimmer, it is the string that is doing the cutting. This string is normally made from a material with similar properties to fishing line; therefore, it is strong and flexible. As it is cutting, the string gets worn, and small pieces of it will break off. There comes a point when the spool containing the string needs to be wound out to release additional string. On some machines, this is done by pushing down with the trimmer onto the ground, which releases more string. On better models, the string feed is done automatically and avoids any need for you to activate the spool feed yourself. When you are trimming, edges, borders, and around awkward lines, it is much easier if the trimming head is adjustable, rather than you simply having to turn the entire trimmer to suit what you are trimming. If you are trimming your garden, you are going to be holding an electric weed eater for several minutes, so you will want it to be as comfortable as possible. First, check the weight of the trimmer as this can range from as little as 3 lbs. to over 10 lbs. depending on the model you purchase. Obviously, choose a weight which is going to be suitable for you. Next, you’ll see that some trimmer lengths are adjustable so that the height of the handle is the most comfortable for you, and prevents you having to bend down to use it, if you are tall. 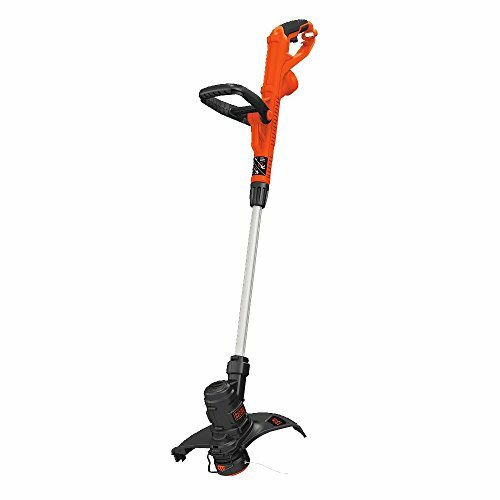 Other features which are designed to enhance the ease and comfort of using a string trimmer are adjustable handle positions, an auxiliary handle, and soft grip handles with cushioning. This is a very basic point, but many people buy an electric string trimmer and assume that it includes the extension power cable. Unfortunately, not all models do, so always check whether you need to buy a cord or not. Also, check to see whether the trimmer has any kind of cord retention feature to avoid an accidental disconnect from the power. Please bear in mind that trimmer string is rotating at a very fast speed, and as a result it is likely to stir up a significant amount of debris while it is cutting through grass and weeds. There is the even greater risk that it may cause small stones and pieces of dirt to fly through the air too. There are two issues here; the first is your own safety, and the second is the safety of anyone nearby. For yourself, you should always wear safety googles whilst using a string trimmer to protect your eyes from the debris and stones. You should also be aware of who may be nearby, such as a member of your family, a neighbor, or a passerby. It is good practice to stop the trimmer should they be close enough for any debris to injure them, and then warn them for their own safety, to keep a good distance away from where you are working. Whenever you see the name Black and Decker on a product, you know you are dealing with a brand that has a huge range of garden tools and equipment. The one we are looking here is the LST136W String Trimmer. The first thing to note is that this trimmer is powered by a lithium-ion battery, so it can be used cordless, although it will obviously need to be charged as and when required. The trimmer has two settings which can impact on how long each charge will last you. The first is called MAX Power, and this makes the trimmer run as powerfully as it can. This is for use when the grass or weeds you are trimming are thicker and more difficult to cut through. The downside is that this will run down the battery quicker. Setting number two is MAX Runtime, which as the name suggests drains the battery slower, but this also means that the power produced is not as great. This will be the setting used for cutting light edges or where the grass is thinner. If you have been doing normal trimming but then need to do some edging with the trimmer, this is made much easier because you can rotate the cutting head 180° by simply pressing a button. This means you can cut neatly along pathway edges, around any features in your garden, or simply along the edge of a flower border that adjoins your lawn. The trimming string is fed from the spool to the cutting head automatically, and it cuts a swath which is 13 inches in diameter. Lightweight – less than 8 lbs. 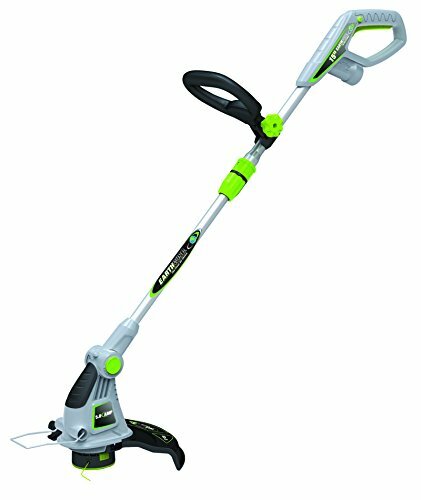 When you first see this electric string trimmer, it looks like it is going to be a heavy tool that requires a lot of brawn to be able to use it. However, when you pick it up and then check its specifications to see that it weighs only 4.3 lbs., we wouldn’t blame you if you were amazed. So, now we have established how light it is, let’s look at what might make using it even easier. The first thing would be the secondary handle, which can be adjusted 180° so that you can have it in the most comfortable position for either trimming or edging. When you are edging, a wheel on the cutting head helps you to make the cut straight and neat. The shaft of the trimmer is adjustable so regardless of what height you are, you can collapse it, or extend it so that it is at the optimum length for you. Whereas the standard cutting length for these sorts of string trimmers tends to be 12 inches or less, with this one from Remington, it is 14 inches. This should make cutting through thicker grass quicker, and more efficient. The trimmer uses a .065-inch dual line, which is auto fed. To prevent small pieces of debris being thrown towards you, there is a debris guard on the base of the trimmer, however, this does not in any way, negate the need for you to wear safety glasses when trimming. Please note that this does not come with the electric cord. This is one of the more innovative designs that we have come across, with a 3-in-1 combo of a trimmer, edger, and mower. In truth, there is just one extra function, which is the mower, because most string trimmers can be used as edgers anyway, but nevertheless, it is still a very clever concept. When using it as a mower, the trimmer head is housed in the wheeled base. You simply switch on and move up and down your lawn in the same way you would use a normal mower. The main difference here is that it is not rotary blades that are doing the cutting, it is the cutting string. Inserting, or releasing the trimmer from the wheeled base is a simple matter of pressing a foot pedal, so there’s nothing complicated about switching between one use and the other. Incidentally, when you are using it as a mower, you can adjust the cutting height so that your lawn is cut exactly how you want it, in terms of how high you want the blades of grass to be. When using the tool to trim or to edge, you can use the large auxiliary handle to guide the trimmer more accurately than having to use it one-handed. The handle height can be adjusted, as can its position, so the trimmer is as comfortable as possible to use. The string spool feeds automatically so you do not have to keep stopping and starting again, and when it is cutting, the string cuts to a diameter of 14 inches. Unfortunately, the cord is not supplied with this trimmer. With luminous green parts adorning this trimmer from top to bottom, it is certainly not going to be difficult to spot, and with the core of the product colored grey, this is one of the best-looking trimmers we have tried out. However, its looks don’t determine how well it functions, so let’s check that out now. It gets off to the best of starts with a cutting width of 15 inches, which is about the biggest cutting swathe we have come across within the electric string trimmer category. Not only is the cutting width impressive, the cutting head can be adjusted to three different positions. This lets you use it from different angles when edging or trimming. The cutting head has a dual-feed which means you have two-lengths of string cutting at the same time. This helps you to cut through thicker grass and weeds, and it is also faster. The spool feeds the string automatically which means the only time you’ll need to have anything to do with the spool is when it is empty and needs to be replaced. At just 7 lbs., this is relatively light, and with an adjustable length, and an auxiliary handle that can be repositioned, everything seems geared towards making this easy and comfortable to use. This goes further with a soft rubber grip over the main handle and an edge guard that can be flipped down before you start trimming. 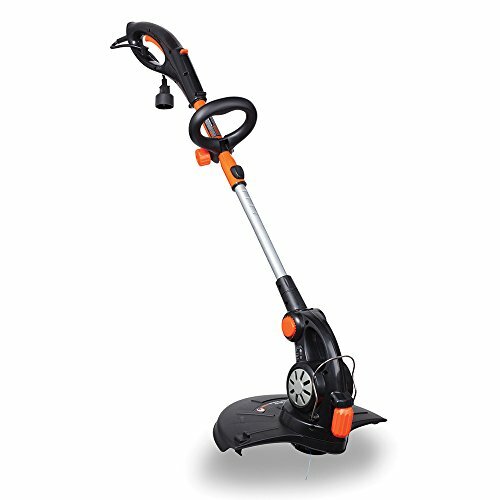 Anyone who is looking for a simple electric trimmer, from a very known brand, should look at the ST8600 from Black and Decker. The first point to make, is how lightweight it is. It weighs only 5.35 pounds so using it to trim all areas of your garden, should not bring about too much strain. 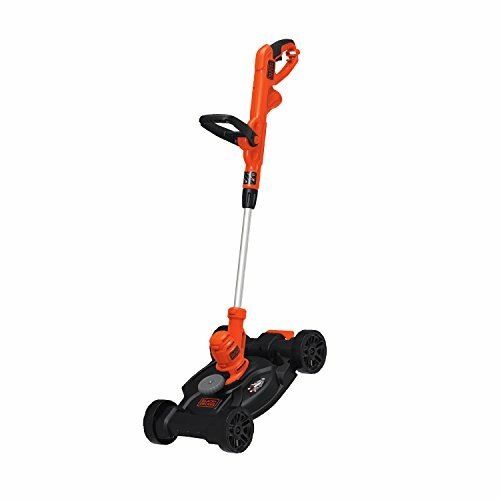 The 5-amp motor, which is at the heart of this trimmer, is powerful enough to help it cut through the toughest of thick grass and weeds. To help make your use of this trimmer as comfortable as possible, the design allows you to adjust the height of the handle up or down, so it suits your height. The auxiliary handle, which is on the shaft, can also pivot so it is in the most comfortable position too. 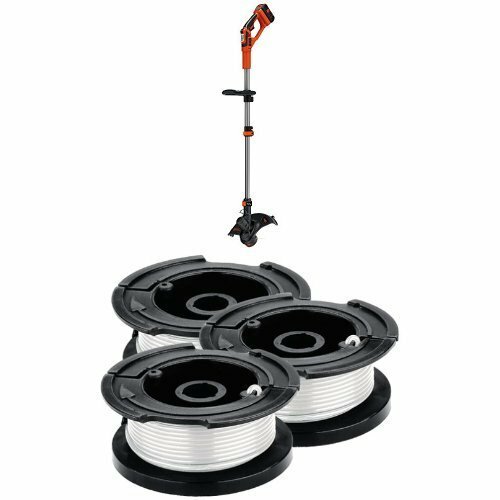 As you’d expect, the spool feeds the cutting string automatically, so there’s no need for you to deal with anything relating to that, except when the spool needs to be replaced. When it is cutting, the string will cut to a width of 13 inches, which is above the norm for these types of trimmers. When you want to edge the side of your lawn, there is an edging guide which helps you to make it the most accurate possible. With your extension cord (which isn’t supplied) plugged in, you can prevent it accidentally being yanked out, by wrapping it around the cord retention feature built into the trimmer’s handle. 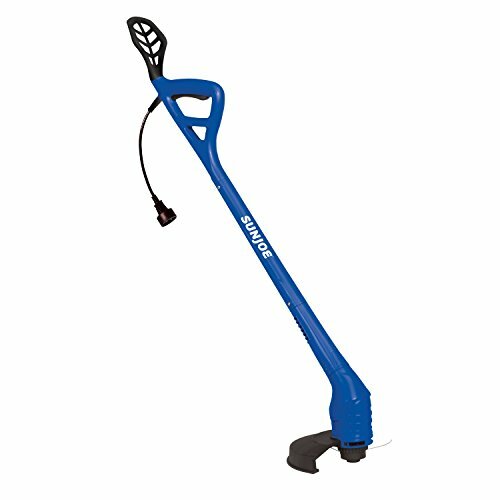 In comparison with all the other electric string trimmers we have reviewed, this one from Sun Joe has none of the more desirable features like an adjustable handle, or multi-positional cutting head. So, right now you may be asking what its appeal is. Well, first and foremost, it will appeal to those who want the simplest and most basic electric string trimmer available. It is exactly that, and while that could mean many will dismiss it immediately as an option for them, we are sure there are others who find that simplicity to be a positive. The second feature of this trimmer, which we think will be very desirable for lots of people, is how incredibly lightweight it is. It weighs a mere 2.8 lbs. which is well below what any of the others weighed. To use the trimmer, you simply press the trigger and the 10,000 rpm motor springs to life. The cutting head cuts at a width of just 10 inches, which is less than others, but if all you want this trimmer for is some light trimming and edging, then that cut length should be enough. To feed the string, you need to tap the trimmer head on the ground, and it should come through. As we mentioned there are no adjustments that can be made to the handle in terms of its length or position, although it has been ergonomically designed to make it somewhat comfortable. This is aided by the wrist holder that should help support your wrist and minimize any strain or fatigue in that area. There was not much to choose between any of these electric string trimmers, but we always like to give our No. 1 choice, and it is the Remington RM115ST Straight Shaft Trimmer. Here is why we believe it is the best electric string trimmer. First, it is very lightweight so its suitable for most people to use. There are also features like adjustable height, and the 180° repositioning of the handle, that help make it easier to use too. Add to that a 14-inch cutting width, automatic spool feed, and the edging wheel, it has all the basics right, with some extras that give it the top spot.